8500GNS GUNNERFLEET NEPTUNE ON ANOTHER PLANET SETTING CENTRE RECORD AT SKIPTON LIMOUSIN ANNUAL HIGHLIGHT. 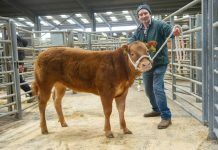 Gunnerfleet Neptune from the celebrated North Craven Gunnerfleet pedigree Limousin herd of father and son, Jim and Ian Handley, secured the top price of 8500gns at Skipton Auction Mart’s premier breed highlight of the year, the annual spring show and sale of pedigree bulls and females on Wednesday 9th May 2018. 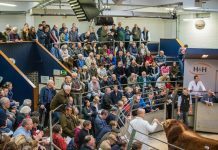 In the process, the January, 2017 Neptune proved to be on a different planet when setting a new centre record high price for a pedigree animal. And it was not hard to see why, as the junior bull arrived with impeccable breeding credentials, being a naturally born calf by the Wilodge Vantastic son, Plumtree Fantastic. The sire, a 40,000gns acquisition by the Handley’s five or so years ago from Nottinghamshire breeder Paul Cairns, has truly lived up to his name. Fantastic sons have sold to 35000gns, while one of his daughters produced Gunnerfleet Mongo who realised 30000gns at Carlisle in February this year. Neptune, winner of his show class and later Junior Male Champion, is out of the Tango-bred Gunnerfleet Fullrose. 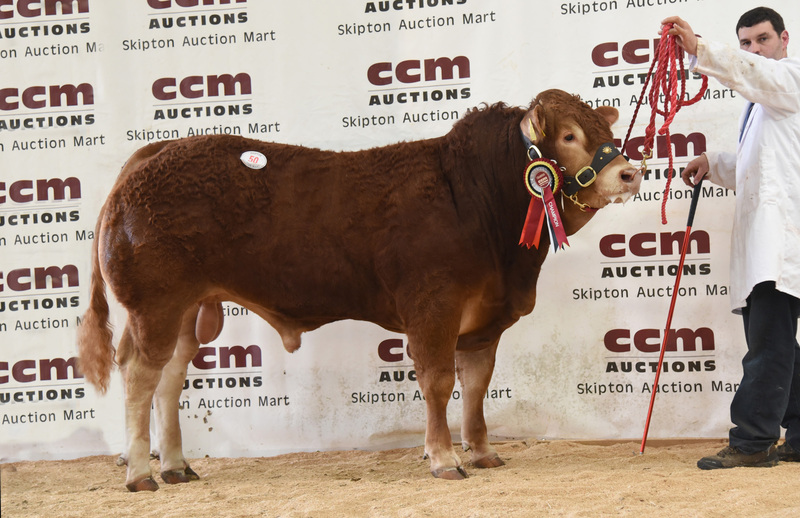 A full brother also sold in 2014 for 8,000gns, a price surpassed by the 8,500gns Neptune, who was claimed by specialist beef producers, Calderdale farming twins David and Stephen Hollings, of Spinkshill Farm, Pecket Well, Hebden Bridge. “We waited for Neptune and were determined to have him,” said David, who has been farming with his twin brother Stephen, who is just 20 minutes older, for almost four decades. 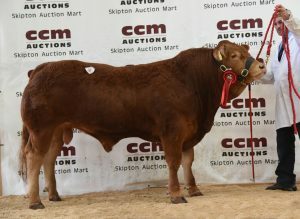 Neptune was specifically bought as a replacement for an older stock bull and will be put to work on the family’s Limousin-cross-British Blue commercial herd, with a view to improving their 12-month-old stores and hopefully producing some more prize winners in the show arena. The Craven Limousin Day showcase attracted a record 119-strong entry, comprising 73 bulls and 46 females, it proved to be one of the best sales to date. 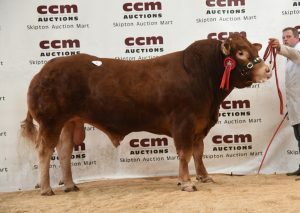 There was a total clearance of intermediate bulls ranging in price from 2,700gns to 5,000gns. 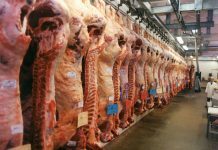 Senior bulls reflected the same demand from buyers for strong bulls ready for work, with a price range of 2,300gns to 5,000gns and just one failing to find a new home. 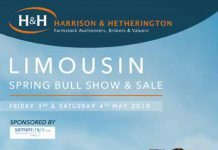 With four junior bull classes, a large contingent of 25 cattle buyers enjoyed plenty of choice and the section returned an 85% clearance rate, with prices ranging from 1,500gns to the record setting 8,500gns. It proved to be an outstanding day for the Handleys, who are based at Gunnerfleet Farm in Chapel-le-Dale, near Ingleton. 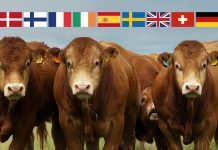 Their Limousin herd was established in the 1980s and now comprises of 50 pedigree cows. 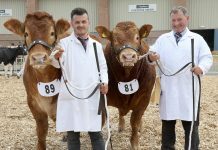 The defending Craven Limousin Day supreme champions sent out a trio of first-time shown intermediate and junior bulls at the latest fixture and all three duly won their classes in the hands of stockman Brent Shuttleworth. First up was the November, 2016, Gunnerfleet Murc, by Maraiscote Graffiti, acquired several years ago as a 17,000gns show champion, whose first four bulls have averaged 10,000gns. 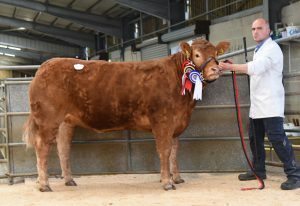 Out of the Nenuphar granddaughter, Goldies Imagination, bred in Dumfriesshire by Jim Goldie and purchased for 12,000gns at six-months-old, the intermediate bull class winner was knocked down for second top call of 5,500gns, finding a new home in Hambleton with Peter Cowton, of Helperby. 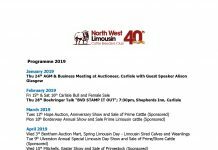 Bringing up a hat-trick of red rosette successes and selling for 2,500gns was another intermediate bull, the December, 2016, Gunnerfleet Marcus, an embryo calf by Broadmeadows Cannon, out the Nectar granddaughter, Ellora, acquired from France as a six-month-old calf some six years ago for 20,000gns. Ellora is also the dam of the legendary Gunnerfleet Hicks, in his time one of the top bulls in the country, whose progeny averaged 18,000gns for the Handley’s, with his bulls selling to 22,000gns. Hicks sold for a five figure sum to Garrowby Estate Farms, east of York. Two bulls also made 5,000gns. The first of them was the first prize senior bull and Reserve Male Champion from Procters Farm in Slaidburn. The two-year-old Procters Mutineer is an embryo calf of the Rossingnol-sired, Haltcliffe Doctor, who has himself sold sons to 9,000gns, this for Procters Major, which joined John and Claire Mason’s Oddacres herd in Embsay last October and is due to have his first crop of calves due on the ground this autumn. 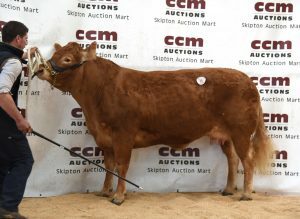 Bred from the Sarkley Volt daughter Bankdale Erin, Mutineer was bought by relatively new breeder John Clayton for his Bentley Brook Limousin herd, Bentley Farm, Wyke, Bradford. 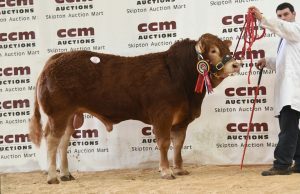 Among several rosette winners in the five-strong team of Procters Farm bulls was a first prize intermediate bull, Procters Mikkelsen, one of the first sons to be offered for sale by another Haltcliffe sire, Dancer, out of the home-bred Procters Elle, who is a full sister to a brace of Procter bulls, Duvalier and Commander which made 22,000gns and 20,000gns respectively. 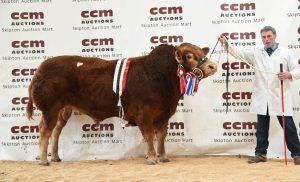 The August, 2016, Mikkelsen rallied strong support in the sale ring before falling for 3,500gns to WI Suddes and Sons, of Cornsay, County Durham for their Cornsay Limousin herd. Established some 20 years past, the Procters Farm herd now comprises around 80 pedigree Limousins. 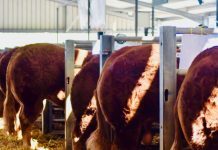 “We have been using AI bulls a lot of late, but now have some new stock bulls in and will be putting them to work soon,” said farm manager Gary Swindlehurst. The second 5,000gns bull, another intermediate, came from Red Rose breeder Robert Howard, who trades as RS Howard & Sons and runs the Whittaker Hall pedigree herd at Guide, near Blackburn. The May, 2016, Whittaker Hall Mario, a son of Wilodge Flyer, out of a Ballinloan Rascal cow, Griseburn Forgetmenot, returned to Lancashire when finding a new home in the Ribble Valley with the Spence farming family in Whitewell, Clitheroe. The Craven Limousin Day Supreme Championship fell to another first prize Intermediate bull, also Intermediate Male and Overall Male Champion, from South Lakeland’s Thor Atkinson, who is a relative newcomer to the breed, establishing his Arradfoot herd in Newland, Ulverston, some three years ago. His June, 2016 born, Arradfoot Madagascar, is a natural calf of the Wilodge Vantastic son, Newton Freeman, the Irish National Champion who has been well utilised as an easy calving stock bull in the herd. Among several show successes, the full brother to the 12,000gns Arradfoot Las Vegas was Male Champion at Garstang Show last year. “This is the best bull we have had off Freeman,” said Tony McGowan, stockman for the Arradfoot herd, which now comprises some 15 pedigree breeding females. The title winner is the second son of the Handley family-bred Gunnerfleet Fortunas, bought as a heifer and who has since proved herself an exceptional breeder. Madagascar was next best on price when landing a 4,800gns bid from J Layfield & Sons, of Crook, Darlington. Mr Ewing nominated the Female Champion, a high quality maiden heifer from Scottish Borders breeder Danny Sawrij, Kedzlie Farm, of Blainslie, near Galashiels in Selkirkshire, as his Overall Reserve Supreme Champion. Kedzlie Farm was making its second appearance at Skipton after sending out the top price 3,100gns female on its debut last year. 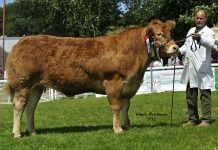 Shown by pedigree stockman Clive Knox, Swalesmoor Mhairi, a July, 2016, daughter of the Ronick Hawk son, Dinmore Goldeneye, bred from the 10,000gns Miscombe Blackbird, outshone her 2017 counterpart when joining a local buyer, Jan Feather, of Sutton-in-Craven, for 3,600gns. “She is very, very correct, showing all the Limousin traits and should make a show cow,” noted Mr Ewing. Female and Reserve Champion Swalesmoor Mhariri, 3600gns. Heading up the female section on price at 4,200gns was the Reserve Champion from James and Sarah Cooper’s Tomschoice herd at Hill Top Farm, Dacre, Harrogate. Their eight-year-old Tomschoice Fiesta, by the Priestley family-bred bull, Brontemoor Aceofspades, used to great effect before being sold to the Swale herd near Thirsk, is out of Tomschoice Allegro. Fiesta was sold with her November-born Kaprico Eravelle bull calf, Nissan, at foot, and also with a service to Milbrook Dartagnan. She rose comfortably in the bidding, before falling to A Glew, of Brighouse, Bradford. Back with the boys, the Priestley family’s Brontemoor herd at Cracrop Farm, Kirkcambeck, near Brampton, continued to consign high quality, saleable and regular prize-winning bulls to the annual showcase. The best of them on price at this year’s event was a third prize intermediate bull, the May, 2016 born, Brontemoor Mandle, a well-bred son of the highly regarded 10,000gns Loosebeare Handsome, out of a Procters Subaru-sired cow, Brontemoor Candle. He attracted a successful 4,200gns bid from P and J Boyle, of Halifax. The three-generation Priestleys, Michael, his son Steven, wife Ruth and their children, Richard and Sarah, also picked up to two show class wins with their junior bulls, both out of home-bred Brontemoor show heifers. One was another 13-month-old son of Loosebeare Handsome, Brontemoor Northwest, out of Evita, the second Brontemoor Neeson, out of Geri, the pair selling at 2,800gns and 2,500gns respectively. John and Clare Mason’s Oddacres herd in Embsay also did well in the junior bull section, notably with a 3,600gns sale of a second prize winner, Oddacres Monarch, a December, 2016, son of Homebyres Dixon, out of the Ange cow, Oddacres Dazzler. He found a new home with Rob Bailes in Aldborough, who is a specialist beef finisher. Reserve Junior Male Champion was another second prize bull from Susan Field, who runs the Cornfield herd in Burnley. Cornfield Ned, a 15-month-old son of Mayfields International, out of Cornfield Jane made 2,600gns. The Senior Reserve Male champion was a December 2015 born bull from Richard Harker’s Overthwaite herd in Holme, Carnforth. His Haltcliffe Fencer son, Overthwaite Lucky, out of the home-bred Holly made 2,900gns. 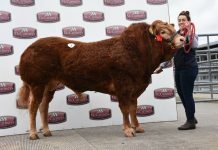 Millington Limousins, of The Grange, York also sold a two-year-old senior bull at 3,700gns. Their Millington Magic, by Norman Hawk, out of the Objat full sister, Millington Harmony, joined WB Rutter, of Scargill, Barnard Castle.